Students and parents alike are encouraged to check out the Prairie Spirit “Future Choice” website at www.futurechoice.ca — documents such as Grade 11 or 12 timelines, career planning guides and more can be accessed under the “Students” tab as well as the “Parents” tab. Spotlight on Careers in Health and Science & Technology: Are you in grade eleven or twelve? Are you interested in a career in health and science & technology? If so, register for this spotlight on careers opportunity. Students will learn about epidemics and pandemics and will have the opportunity to participate in hands on lab activities at the Vaccine and Infectious Disease Organization International Vaccine Centre. The event takes place on Tuesday, October 23. The deadline to apply is Wednesday, Oct. 10. See Ms. Cooper for more information or to apply. Connected- Young Women Exploring Careers: CONNECTED will link young female students from grades 10 through 12 with female mentors from a vast spectrum of career backgrounds. This event gives young females the opportunity to: receive career advice and guidance from professional women, develop career connections and explore various career options. The event takes place on Wednesday, November 7th from 5:00 – 8:30 is free and includes dinner. The deadline to apply is Wednesday, Oct. 24. See Ms. Cooper for more information or to apply. Spotlight on Careers Nursing Panel: This evening events invites high school students and their parents/guardians to listen to a varied panel discuss their personal nursing career journeys. The panel focuses specifically on career opportunities in nursing and the educational requirements for the various programs. The event takes place on Wednesday, November 14th from 7 – 8:30 at BJM. The deadline to apply is Thursday, Nov. 1. See Ms. Cooper for more information or to apply. 3D Printing Skills Boot Camp: Interested in a career in design, drafting, or product development? Then be sure to check out this boot camp. You will learn from experienced Saskatchewan Polytechnic instructors and will take part in hands-on activities on leading-edge equipment with a focus on CAD/CAM hardware and software. The boot camp takes place on Tuesdays (4:30 – 7:30 p.m.) beginning on Tuesday, October 23. The deadline to apply is Tuesday, Oct. 16. See Ms. Cooper for more information or to apply. Women in Technology Workshop: Are you a female and fifteen years of age or older? Are you interested in learning more about mining engineering technology? If so, be sure to register for this exciting workshop. The event takes place on Saturday, Nov. 24, and the cost is $20. See Ms. Cooper for more information or to apply. 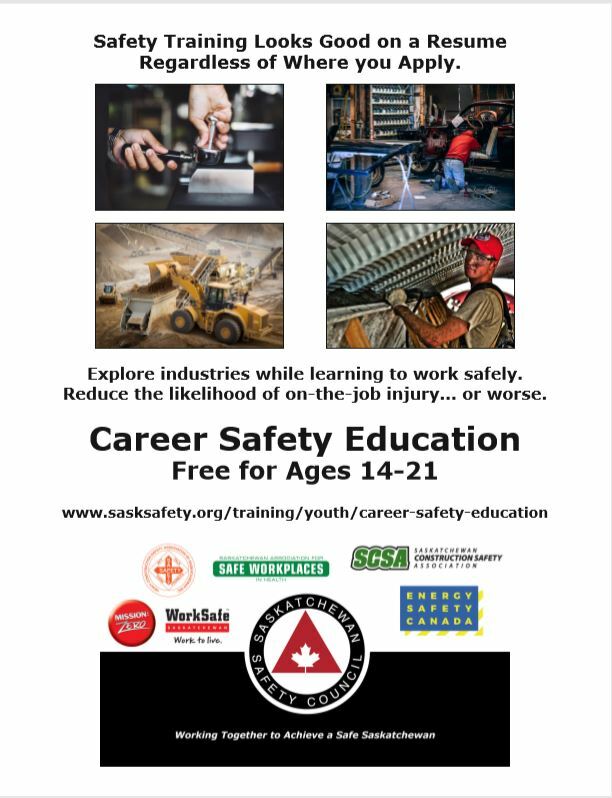 Women in Trades Course: This hands-on course is offered through weekend workshops and includes an introduction to a variety of basic trades skills including: auto body, automotive, carpentry, electrical, machining, plumbing, and welding. The course is four weekends long and runs in the fall and winter. The cost is $300, but a few sponsored spaces are available. See Ms. Cooper for more information or to apply. Saskatchewan Polytechnic – Students wanting to apply for a First Qualified/First Admitted Program should apply as soon as possible. All students: Take some time to set up an account or profile on the following databases for scholarships: Scholarships Canada, yconic and Student Scholarships! There are lots of scholarships out there, it just takes some time to find them and fill out application forms!